Last week I had a meeting with Patricia, the program director at PAN. It was a meeting that I had been feeling nervous about for several days. It was an important meeting. A meeting in which I really did not want to sound like an idiot aka a unitelligable non-spanish speaking word-vomit-girl. And the reason that I didn’t want to sound like an idiot?…primarily is because we were going to be talking about something I know a lot about, something I had spent the better part of 3 weeks researching, writing and of course translating. It was the meeting in which I would present to her my idea about the 1 on 1 pull-out program at PAN. Basically this little jewel of an idea was created because of my experiences working at a developmental preschool last year in North Little Rock (shout-out to my homies at SGS) It was there that I really began to understand the power of 1 on 1 intervention with kids who just were not getting the stimulation, the attention, the experiences to develop (or even play) at home. The kids that come to Centro de Atencion are these same kids, different countries, different language… but they live the same world. They have really similar needs, primarily surrounding some much-needed positive adult attention. And some help getting those neuronal tracks (sorry dork moment) fired up to get their development rolling. So, the meeting exceeded all expectations. Patricia and I talked for about 3 hours. She loved the ideas. She recognized the need. She was so appreciative of all the resources and suggestions. She is going to start looking for a teacher. Hopefully Super Kids (and Gladney) will be able to help support PAN to bring this program to fruition. The kids are on vacation now, so the plan is that when I come back for a few weeks in March, I will help train the teacher, and work with her to get the program started– identify appropriate kids, set up realistic plans of care, and choose appropriate interventions. I am thrilled. Patricia and I have even talked about potentially extending this model to their internados (the kids who live at the institution) as well. Though it is not a school environment, these kids could still really use the 1 on 1 time!!! Casa de Maria has been creeping into my heart for a while now, and I have not told you all nearly enough about it. They serve (this is a guess) about 60 kids there from baby baby to 14 years old currently. I am working with (depending on the day) 6-10 kids there. Most of them are the typical orphanage developmental delay. The reason the number fluctuates is because I could honestly work with ALL of them. But there are 3-4 that have significant delays and neurological impairments (geek moment number two, sorry to the novice readers, promise it wont happen again). The absolute amazing part about working with this type of population is how incredibly rapid their progress is at the beginning!! When a toddler goes from very few opportunities for play to suddenly spending a few hours a week playing (to the novice eye that is… really I am giving them an opportunity and motivation – toys- to perform age approrpiate movements) they seriously bloom!! I can’t take credit for all this, we have to give kudos to typical development and of course these kiddies themselves but, here is a list of things that are now happening (that were not when I first got there): 2 kids walking without assistance -still falling a lot, but can now get back up on their own too, 2 babies pulling to standing and bouncing around in their cribs (way more fun than sitting in it) and 1 just teetering on the verge of sitting up by herself. Awesome! Yesterday Gloria and I played hookie and were tourists for the day. 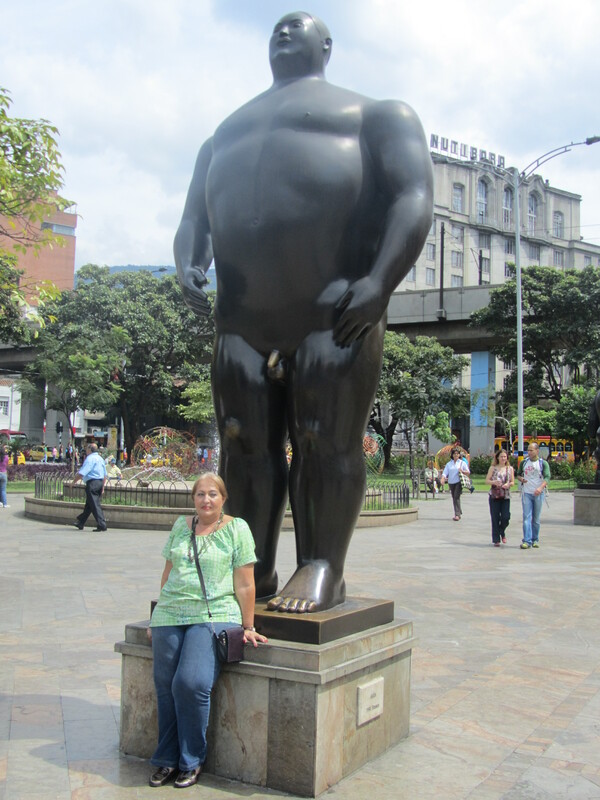 We went to the museo de antioquia which features this Colombian painter named Fernando Botero. Oh how I love art museums. Sooo, what he says is that these people, his subjects, “are not fat, they are voluminous.” Isn’t that great?! I love it. 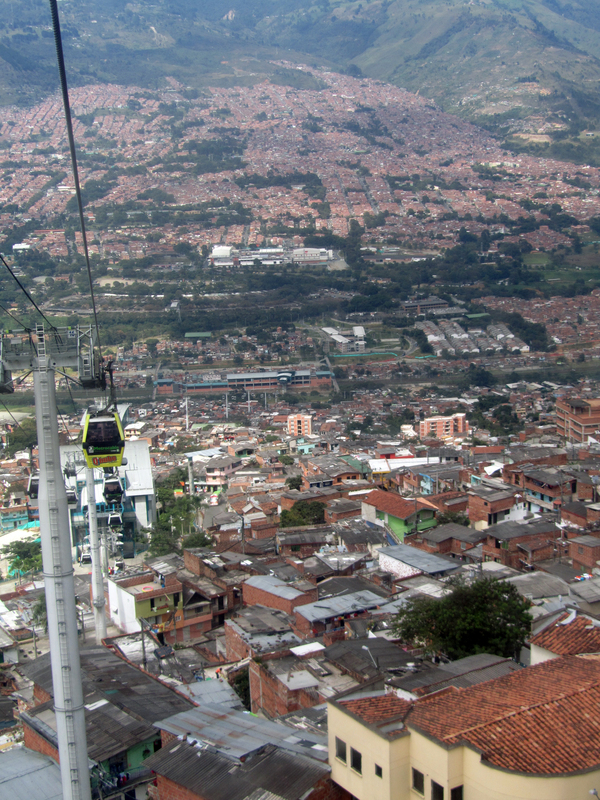 Then we spent the rest of the day riding the various metro cable cars. 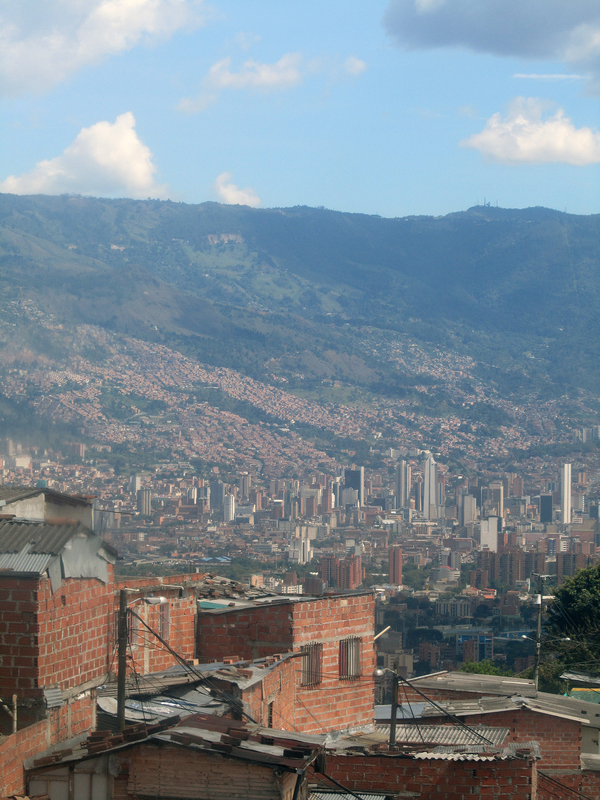 As I have said before, much of the city (especially as it expands) is rising up the hillsides. 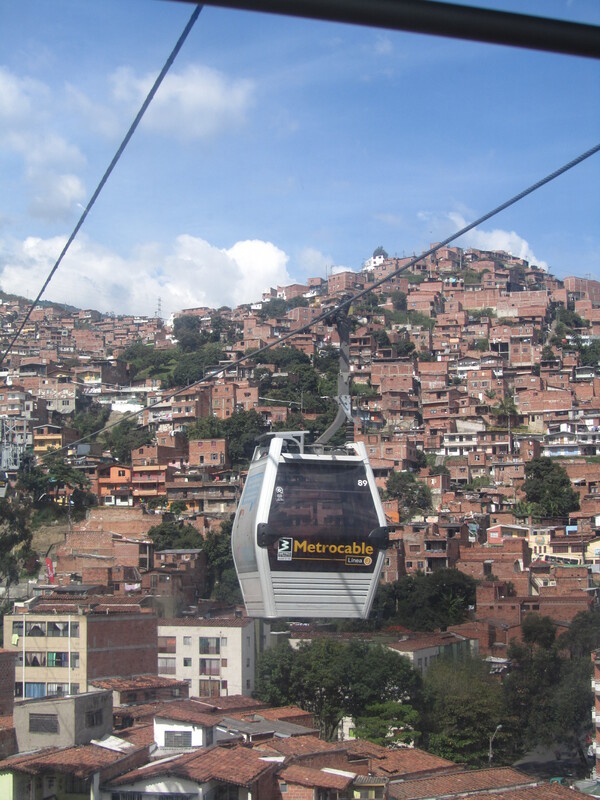 Thus to accommodate this urban growth, the metro has started two lines that rise up and serve the mountain side barrios. It was amazing. Fantasic views. Beautiful colors. It really became obvious the reality of the mudslides I had heard about on the news as I could see evidence of them on they trip. 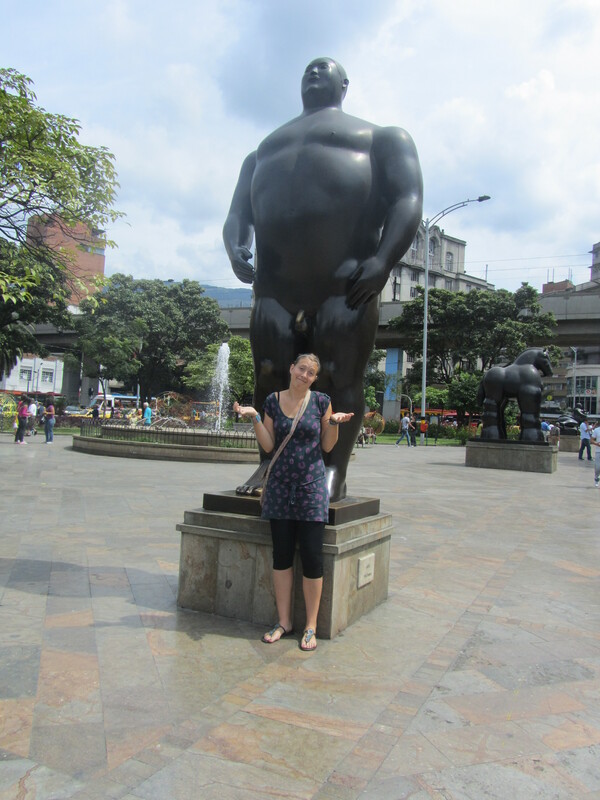 And the best part, the entire day cost Gloria and I 6,200 pesos (3 USD). And I am always a sucker for a good deal. I read all the new “going ons” to day. Sounds GREAT! I’m not much for writing. Essay in school always gave me problems. I did not know how to spell most of what I wanted to write. Spent the day finishing a small quilt top which when quilted will go to some one who has cancer. I have five tops ready to go when I cut some binding. It was good to see Josh, Alex, Jack. I had not seen J/A since they married.